I consider myself very fortunate to say I worked with Jim Zabel. I was a young kid that recently graduated from Iowa State in December of 1993, and my first professional job was with the 50,000 watt powerhouse WHO in Des Moines in May of 1994. I recall seeing Jim for the first time and thinking “wow this is pretty cool.” Like most Iowans, I listened to Jim growing up in the 80’s do all the Iowa Hawkeye games. I filled in for Jim on occasion doing the afternoon sportscasts on WHO through the 90’s, but my most direct memory was being his radio engineer for the Iowa Barnstormers games in 1995, 2000 and 2001. I did all the home games in 1995 and traveled with him for all games in the 2000 and 2001 seasons. The first ever Barnstormers home game was against the Miami Hooters in 1995. Richard Lee did the road games that year and we both came down to old Vet’s Auditorium days before to run through my responsiblities for the upcoming game. I’ll admit I was a bit nervous. I was going to be sitting beside an Iowa broadcasting legend after all and didn’t want to screw anything up. Turns out I did. I remember not being able to connect to the studio and we missed most of the pre-game. I was running around frantically looking for a building official to help me with the line. Z wasn’t too pleased with me. He was definately agitated. But we eventually made it on the air and Jim was very cool with me after the game. Rookie mistake. Lesson learned that evening. 2000 was probably the most fun year I had because it was the last year the Barnstormers were in the old “Arena 1” before they dropped to “Arena 2” the next year. We traveled to Phoenix, Nashville, Buffalo, Grand Rapids, Houston, Oklahoma City and Milwaukee. As a 29 year old that year, I thought that life was pretty good. Jim would also call on me from time to time to either sit in with him or fill in for him on his “2 Guys named Jim” show that airs Sunday nights on WHO Radio. That’s the one thing I really respected about Z, he didn’t hesitate to ask me to help him out when he’d be gone for whatever reason. I’d be lying if I didn’t say it was cool to fill in for Jim Zabel. Thanks Jim. I enjoyed working with you. Appreciate the respect you showed to a kid like me just getting started. It was fun. RIP Mr Hawkeye. Blogging tonight from Cleveland, Tennessee. The run for Grand View baseball has ended after a tough loss to Avila (KCMO) 12-10. The Vikings couldn’t hold a 6-0 lead after 2 innings and saw their season come to a close at 26-21. GV won a comeback thriller over LSU Shreveport earlier in the day 6-3 to get their first ever win in the NAIA Opening round. But the topic of this blog is not about our trip here. It’s more about how fortunate I have been to cover Grand View athletics the last four school years. Everyone likes covering a winner. GVU is definately that. You begin last fall with football. Back to back conference champions. Then women’s basketball. 3 trips to the Sweet Sixteen (including 2 in the Elite 8) in the last 4 years. Men’s soccer makes another trip to the national tourney. Baseball and softball both make the national tournament. Men’s golf finished the year ranked in the top 10. OH! And how could I forget the wrestling program!! They’ve only won the NATIONAL TITLE the last 2 years!! I proudly call myself the PBP Voice of Grand View University. This has been a great place for me to “hone” my skills. I’ve learned alot. And I don’t take for granted the opportunity I’ve been given to have “a home” to call my own. Four years ago I had ZERO play by play experience. None. Zilch. Zippo. I am a more rounded broadcaster than I was in 2009. Being the Voice of the Vikings has also given me other opportunites for PBP. I called Dowling basketball for two years and shared duties with Ric Silvestrini on the IHSSN (Iowa High School Sports Network) during the state tourneys in March. Thank you for having me Grand View. Appreciate being part of your family. Looking forward to year number five beginning the end of August. Yes I freely admit it. I am a twitter(aholic). I love the exchange of stories/ideas and opinions. I have had fun interacting with people from literally all over the world. Mainly people here in the states, but Canada and a few in the UK too. I’ve also made some good friends. A few in no particular order: @donlynturnbull, @planet_rawr, @sherry_keller, @emitoms, @canadiancarla, @kat1457, @prezmike25, @s_j67, @jmedinaphoto, @tigerdan4, @matthewmurphy and @nickgryniewicz. I even found someone with the same birthday as me, which was very cool (@thesmartchic). There are ALOT of good people out there and connecting with like minded people is uplifting. Twitter is a great place to start a prayer chain. Case in point last year when my nephew Malachi was born. He came into this world a bit earlier than we’d have liked on June 7th weighing just 2.2 pounds. I shared it with my followers which intern gave Malachi some adopted twitter “Aunties,” who took him to prayer. @Yankees_pbrfan, @Adallasqtpie, @Chloecat317 and @erinelephant83. I’m happy to report Malachi now weighs over 16 pounds. This is how we will be communicating in the future. Online. The Washington Nationals AAA affiliate in Syracuse became the 1st team to not broadcast their games on the radio, instead opting for internet only this year. MLB, NFL and NHL is headed there too. It may not be for a few years, but it’s on the horizon in the distance. I am a radio geek. I love radio. So as a radio lover, it’s sad to see this. Happy tweeting. Hit me up @geoffconn, would love to hear from you. Right now as I type onto my laptop, I am sitting in the lobby of the Marriott Hotel in Kansas City, Missouri on the off day of the 2nd and 3rd (yeah that’s stupid) rounds of the NCAA Tournament. 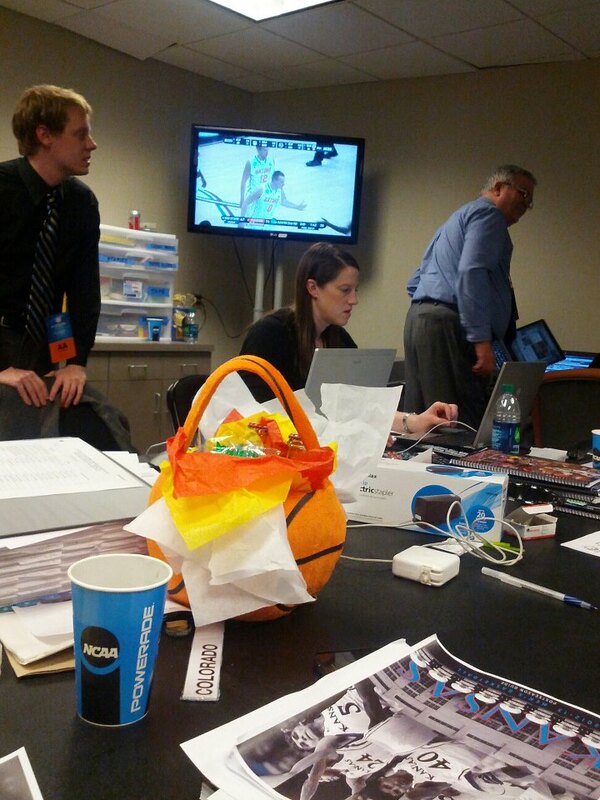 I am volunteering for the NCAA helping out in “media relations.” It’s been a great time. I love KC. Next to my hometown of Des Moines, it’s my 2nd favorite city in the U-S of A. 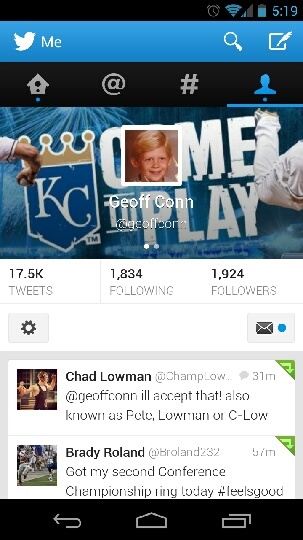 Yes for those of you who know me, it’s because I am a true blue KC Royals fan. It’s also the closest “big city” to Des Moines, just 2 and 1/2 hours south on I-35. Sorry Omaha, I don’t count you. 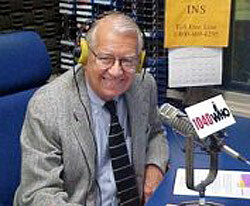 Last April I attended the wedding of my old broadcast radio partner Larry Cotlar. I sat beside the longtime SID of Drake University in Des Moines, Mike Mahon. He mentioned to me about volunteering for the KC NCAA Tourney in 2013. Right now I am in a “transitional period” in my professional life, so I was free. After an email to the SID of the Missouri Valley Conference, Mike Kern….it became a reality (The MVC is hosting). I had never been to a men’s tourney, so I was pretty excited. I went to the women’s regional in Des Moines last year and I have also been to a couple of early round games when the Iowa State women hosted in Ames. Game #1: Wisconsin vs Ole Miss. The Badgers couldn’t buy a basket and were upset by a team that was fighting for their tourney lives one week ago. Beauty of this event. Rebels 57-48. Game #2: Kansas State and LaSalle. The Sprint Center was painted in Purple for this game for nearby KSU. There may have been about 100 LaSalle fans who made the trip from Philly. Great game, LaSalle took a big halftime lead before the Wildcats would rally to tie, only to lose in the end 63-61. Game #3: North Carolina vs Villanova. Pretty good ball game. UNC would take a sizeable lead in the 1st half (20 pts), before Nova would again make a furious rally. Roy Williams squad would hold them off 78-71. It was his 700th career win. Game #4: Kansas and Western Kentucky. Dandy of a game. Despite playing a quasi road game, the Hilltoppers made things VERY exciting. A made shot or two by WKY and I might have been witness to the first ever 16 seed over a 1, but it wasn’t meant to be and the Jayhawks survived and advanced 64-57. 8 inches of snow is predicted here by Monday morning. Hopefully everyone will be able to get home safely. (Behind the scenes before the Kansas/Western Kentucky game Friday night at the Sprint Center). I was laying in bed late the other night. And it just popped into my head. It’s March 7th! I did the math in my head. 1988. 25 years ago I enlisted into the Army Reserves. I’ll always hold this day special. It was a definite turning point in my life. My senior year of high school at Des Moines East, I stopped by (I have no idea why) an Army Recruiter table at our school. My recruiter’s name was SGT Jenkins. (Funny what things you remember in life, eh?) I filled out a card and he followed up with a phone call which later led to a visit to my house with my parents. He gave a simple presentation which included the GI Bill. RE: Money for college. That was the ONLY reason I even considered joining the military. Because I knew that my parents weren’t in any position to help me out financially. I don’t at all say that with disregard or malcontent. I am very happy my parents made me pay for school on my own because it made me a much more indepenent person. Also I was the first of 4 brothers to go down this road. So SGT Jenkins made his final pitch and stopped talking. I thought about it for a second. Said….sure I’ll do it! I know I shocked my parents and sort of shocked myself too. As a minor, I had to get their signature to make it official. I can’t tell you how much easier it was to go through college (Iowa State) getting a monthly check from the military and doing a monthly weekend drill. (Thus how the Reservists are called “Weekend Warriors”). It was plenty to make a poor college kid live off of. As an added bonus I also got the “Loan Repayment Program,” in my enlistment. This meant after graduation, the military would pay 10% of my loan for every remaining year of my enlistment. This helped take a big chunk out my school loans (which I am proud to say are all paid off). My time in the Army Reserves (March 1988 to March 1996) was the same time as “Desert Storm.” My job was a 31K (Kilo) which was then titled “Combat Signaler.” When I entered the Army I already knew what I wanted to do in my professional life and wanted to be in communications in the military also. “Combat Signaler” was simply field communications. RE: Field telephones and running wire for switchboard communications. Which is now non-existant in the Army. Everything is digital, just like the real world. I don’t consider myself a “hero” by any means. The real hero in our family is my father Don who did 2 tours of Vietman as a SGT in the Marine Corps. He also is the recipiant of a “Purple Heart.” My dad went through hell there and I am so proud of him. It’s hard for me to talk about him without getting emotional. I was in an Engineering Unit based out of Des Moines (372nd ENG GRP). I did three weekend drills there before shipping out to Basic Training in June of 1988 at Ft Jackson (Columbia), South Carolina. Talk about a life changing experience. Especially for a 17 year old. I spent 10 weeks there and returned mid August just before the start of my senior year in high school. I was a “Split Option Trainee.” This meant I did Basic Training and AIT (Advanced Individual Training-Army Schooling) a year apart. Normally regular Army people do that back to back before being assigned to their permanent station. Then in June of 1989, right after I graduated high school, I did it all over again. Except now I was headed to Ft Gordon (Augusta), Georgia where I learned my 31K job specialty. AIT wasn’t quite as bad as basic, but you still had Drill Sergeants who bossed you around. My favorite memory of basic was that I could imitate the voice of a DI in our company. He’d always say “GET OUT OF MY WAY!” So we’d be out as a company together and I’d walk up behind my fellow trainees and say “GET OUT OF MY WAY” (in a deep manly future radio star voice) and they’d all turn around freaked out and thought I was him, which cracked me up. I know I wouldn’t be the same Geoff Conn if I hadn’t decided to enlist for those 8 years. I am very proud to say I have. It helped shape me to be the man that I am today. 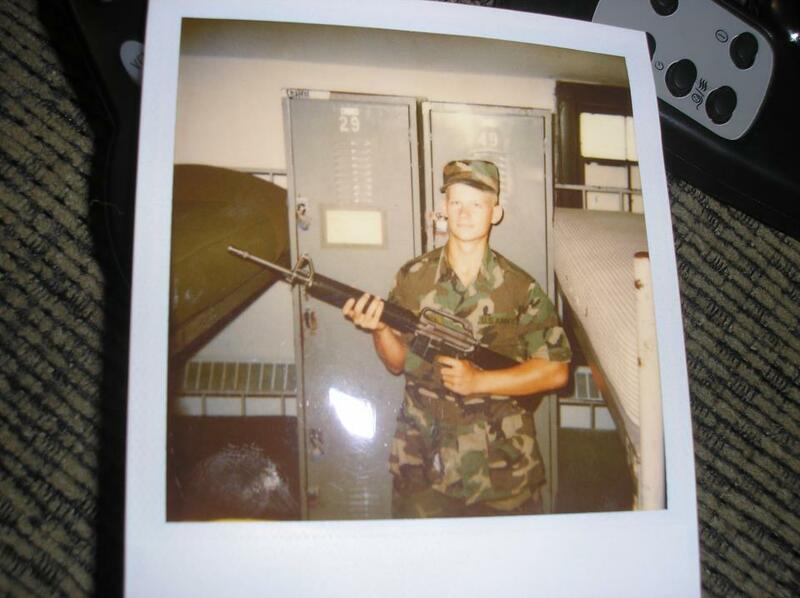 At Basic Training in the summer of 1988 in Ft Jackson, South Carolina. These past two weeks I’ve been given the fortunate opportunity to call some games for the Iowa Girls/Boys state basketball tournaments. A few included television. This is something I’ve always wanted to do. TV play by play. I admit I started to wonder if it was ever gonna happen for me. Last fall a colleague of mine, Ric Silvestrini, approached me regarding being a part of the Iowa High School Sports Network (IHSSN) during “March Madness.” I jumped at the opportunity and was excited about it. Ric is the current voice of Drake women’s basketball. I was a bit nervous about the whole deal because I’m a radio guy with zero TV experience. Friends I talked to assured me that I’d do well, which was definately comforting. 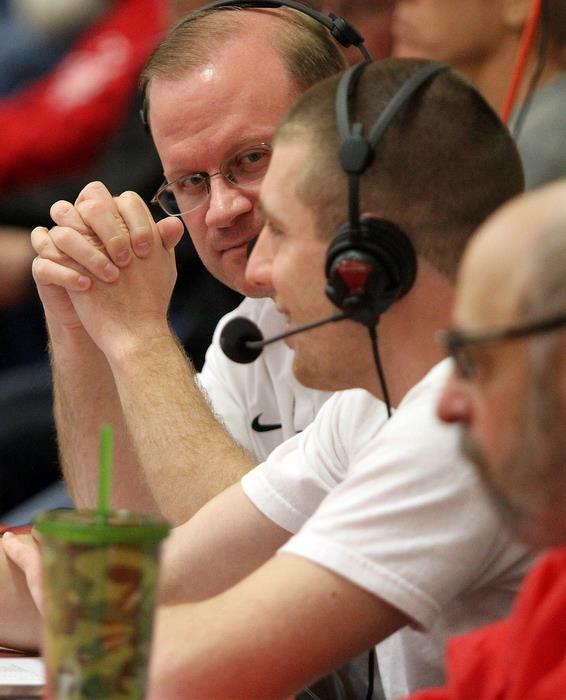 I’ve gotten great experience as the play by play voice for Grand View the last 4 years. Who knows where this may lead. I’m hopeful that this is just the beginning for me. Many of you who know me personally know how difficult my professional life has been over the last 4 years or so. I’ve continued to stay positive as possible. There have been ups and downs. Getting fired for the first time in my life has made me look more to the present than the future. I have absolutely no idea what the future will hold for me. I don’t worry about it. I’m all about the NOW than the LATER. I want to thank all of my friends and family for their support. It hasn’t been easy. I love you all dearly and don’t take you for granted. Here’s to a unknown future. Thanks for reading. Tonight I got to hold my soon to be 5 month old nephew for the first time. His name is Malachi. (For those of you unfamiliar with that name, it’s the final book in the Old Testament). Malachi was born on June 7th. He weighed 2 lbs, 2 oz. 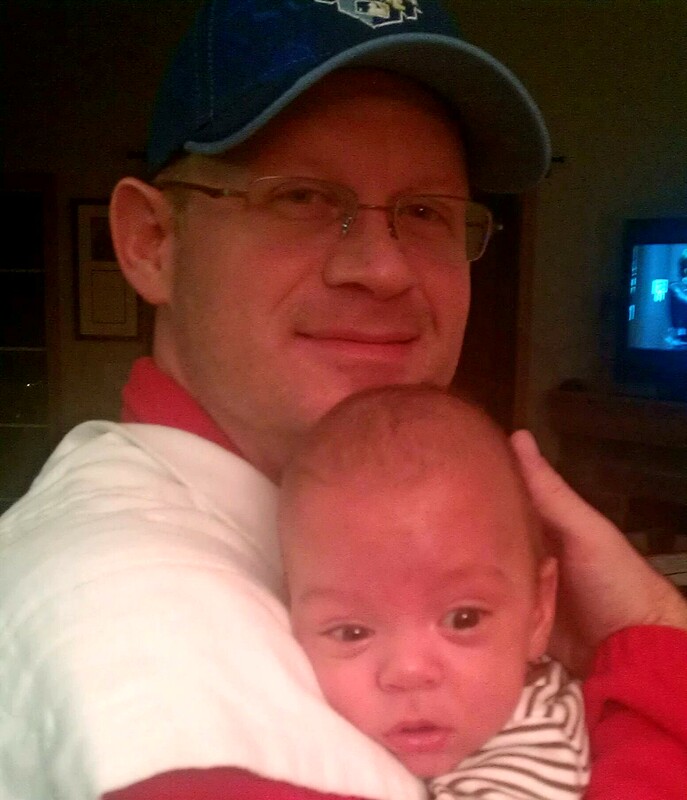 He lived his first 3 months in the NICU at Iowa Methodist Medical Center in Des Moines. He went home to the joy of his parents Adam (my brother) and Eva (Sister-in-law) on September 11th. I’ll never forget that first night I saw Malachi in the hospital. It was about a week after he was born. His skin was all wrinkly, but even at 2 lbs, 2 ozs, he was full of life. I remember having to hold back tears when I first laid eyes on him. He had I-V’s all his little body, a little oxygen line underneath his tiny nostrils and still had the strength to pull them out. They had to wrap up his little hands so he wouldn’t do so. I have always been a Pro-Lifer, but after witnessing the development of my nephew the last 5 months, I have been given a deeper appreciation of how precious life is. He now weighs over 10 lbs. I know I speak on behalf of Adam and Eva when I say THANK YOU for all your thoughts, prayers and well wishes since the day Malachi was born. (Especially to his adopted Twitter Aunties that follow me: @yankees_pbrfan, @adallasqtpie, @chloecat317, and @erinelephant83). He was recently taken off of oxygen about 2 weeks ago and is a thriving little baby. Holding and feeding Malachi tonight brought a big smile to my heart. Looking forward to being an active Uncle to him.